The Priority Planning Process is life changing if honestly used. And I do not make that claim lightly. If you actually use the process — and use it regularly, — you are taking action every day towards your goals. You are also living the life you truly value. There are three essential steps in the process, and a fourth if you want the optimal psychological boost. But more about the fourth step later. The three most important things you need or want to accomplish that day are your A tasks. You will do these today. Your next three most important tasks are your B tasks for the day. Then come three C items, and the rest are Ds. (If you don’t like A, B, C, D, keep reading, the coding is adaptable.) Make certain one of your A tasks is something that moves you towards a larger goal, even if it’s a small task like creating a punch list of other tasks to do. 3. 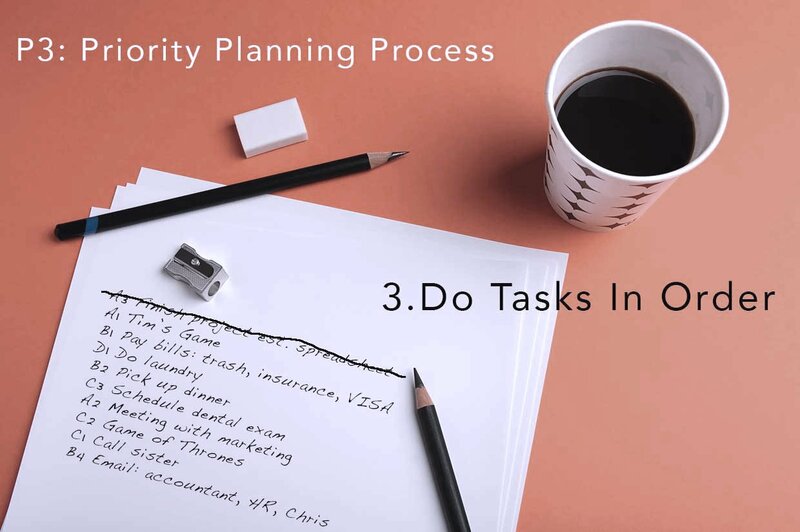 Do the tasks in priority order. 4. Review what you have accomplished. Bump uncompleted tasks to the next To-Do list. Be sure to look for patterns, such as tasks repeatedly left undone — especially if the tasks are connected to a major goal or priority in your life. (We’ll go deeper on this topic in another post.) Why don’t you do this task? Is it truly important? Is there something you need to do before you can complete the task? 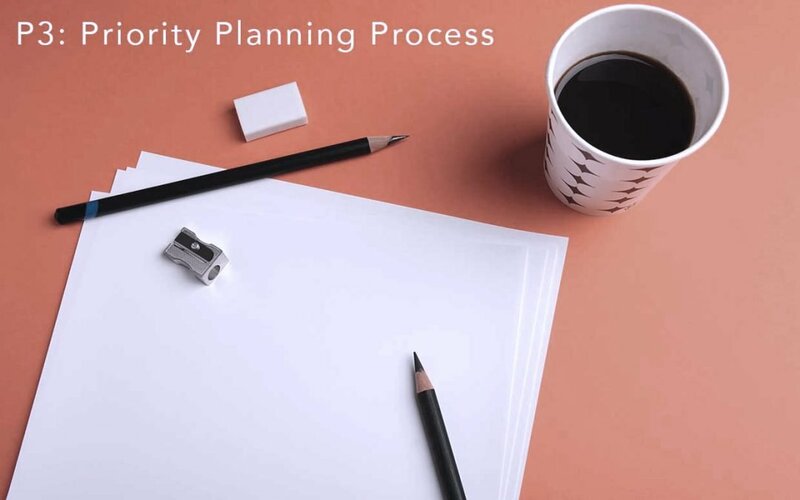 Fortunately, the Priority Planning Process requires only a little discipline and self-awareness, and, like fitness, it becomes easier and more effective as you successfully work at it. What Goes On Our To-Do List? Or lists, actually. Before we can know what we truly want to accomplish today, we need to know what we want to accomplish this week, this month, this quarter, this year, this decade — this lifetime. what you want to accomplish today. Why? Because each day one of your A priorities should be a task that moves you towards accomplishing a life goal. It doesn’t need to be a big step towards that goal. But take some action toward at least one of your goals that moves you towards a life goal every day. For example, say one of your life goals is to attend the Great Basin Astronomy Festival (or the Albuquerque International Balloon Festival or Fashion Week London or whatever calls to you). Before you can make this happen you need to break down all the things that have to happen before that goal. Certainly one of the things you will need is enough money and free time to attend. So one of your A tasks will be to calculate how much time and money you will need to achieve this goal. That may be all the time you to spend on that life goal today — but tomorrow you can make an A task figuring out how long it will take you to get both the time and the money. Don’t have a list of what you want to achieve in your lifetime? Or not certain you’ve got the right things on your list? We’ll be covering this subject in another post so stay tuned (or sign-up for the newsletter to be notified). Do I Have to Actually Write the List? What Kind of Planner Do I Use? You can use any kind of planner or system you like. Or even no planner. I’m a big fan of Post-It notes. I usually write my daily To-Do list on a Post-It and stick it to the back of my phone. I like Moleskine Weekly planners but if I see something beautiful at my local bookstore I will switch. You can easily use a digital planner, as long as you can add notes. In a pinch, I’ve used my Google Calendar. If you’re a Bullet or Dot Journal fan, you can easily add the Priority Planning Process to your system. You can either write your To-Do lists (daily, weekly, monthly, annually) in your journal, use Post-Its, or add a list with washi tape. I’m Visual. Can I Prioritize With Something Other Than Letters? Yes. You can create your own symbols or color-coding if you prefer. For example, Stars or red for As, hearts or blue for Bs and so forth. But you must use 1,2,3 to prioritize tasks within your symbols. No more than 3 items for any category. Why? Because our brains have been trained to think in sequential order, that is, 1, 2, 3, and so forth. We think of being first versus coming in second. We want a #1 rating. Even without visual numbers, we prioritize or rank items in order of importance. Also, we need to limit the number of items on our list to improve motivation. We can only get so much done in a day. A list that never gets completed is discouraging. As you complete items on your list, cross them off. Do NOT erase them, Cross Them Off. Because neurological science has shown that we get a little burst of dopamine and a sense of accomplishment when we cross things off as done. That boost strengthens as we see more tasks cross-off our list as completed. It gives us a tangible and visual recognition of our successes and achievements. It’s like giving ourselves a pat on the back. It’s especially nice when you review your list later. It increases our motivation, resilience and commitment. And yes, if I have to do something that isn’t on my list, I add it to the list — and then cross it off. I need all the psychological boosts I can get! Especially in winter. But watch out. The dopamine hit and mood boost are why we tend to do the easy tasks first, even if they aren’t really moving us toward our goals. So we need the Priority Planning Process — and some initial self-discipline — to help us work on what matters and not on how much we do each day. Do I Really Need to Review My List(s)? Yes. You get an emotional and psychological boost and stay focused. You reinforce your self-awareness of your genuine accomplishments and successes and of any creeping distractions or negative habits. If you are adding lots of unplanned tasks to your list each day, ask yourself why? 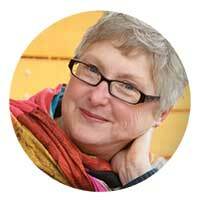 Do you need to break down the items into smaller tasks before putting them on your lists? Or are you getting sucked into other people’s demands for your time and what is important to them? Or are you resisting a goal because niggling little voice telling you something is wrong? Procrastination isn’t always bad. Sometimes it is our unconscious telling us we haven’t thought something through. We need to wait. If that appears to be the case, perhaps you should work on the next project on your prioritized list. Just make certain you are doing something that matters to you every single day.